On the eve of some of the busiest travel days of the year, airport scanners are causing hysteria–and with good reason. Never mind the puerile TSA screeners giggling at your naked body. It turns out that the things may pose serious health concerns. In a letter to John Pistole, administrator of TSA, New Jersey Congressman Rush Holt, a scientist and the Chairman of the House Select Intelligence Oversight Panel, raised the possibility that the machines might be carcinogenic. Various experts have questioned whether older people and children ought to be subjected to scanners, and whether people susceptible to or having melanoma and cataracts should undergo the scan. Just to be sure I am not going off the deep end on this subject, I emailed Steve Elson, the intrepid former Navy Seal who worked on the federal government’s Red Team, which was deployed in the years before 9/11 to test airport security by infiltrating through check points. This they did with ease; but noone ever paid any attention to their reports. Since 9/11 Elson has worked on and off with television crews, continuing to penetrate airport security carrying with him all manner of guns and IEDs, and for the most part avoiding detection. In a CBC program last year at this time, the Canadians reviewed the air security situation and found it to be wanting. The reporters also got hold of a redacted report from the Canadian transport people which raised questions about the effectiveness of full body scanners, especially when they are used in combination with metal detectors: A person passing through one machine after another would have to place their arms in different positions and the Canadians found the body scanners would fail to detect objects like rings or bracelets on extended arms because the mechanism could not reach high enough to take them in. When I was traveling through Chicago last January on my way to Toronto to do an interview, I had some time between planes. Got a sandwich. No place to sit down so I literally walked into the back of a checkpoint that was enclosed by glass so everyone could see what was going on, sat down on a bench and ate my sandwich, and watched. Noone touched the pilots. Ergo, all I needed was a pilot’s uniform, bought or stolen, and a photoshop badge. Put explosives on my body, no metal, walk through, pick up my stuff and off to the plane. Likewise, I could do something similar on the ramp. Best time is in cold weather and snow storms. Do it as night approaches. People don’t care about security, just getting the job done and getting out of the weather. Steal a bag tag, make an unauthorized entry (no problem), walk up to a plane and throw it in with 50 lbs explosive. 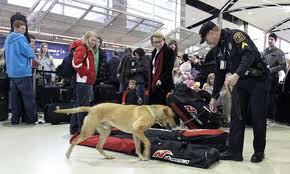 In my opinion, the best answer to airport security is the mass deployment of dogs. Give me a friendly German Shepherd, and I’ll gladly submit to being sniffed, rather than patted, wanded, or scanned. But unlike the scanner companies, dogs have no powerful lobbyists, like former Homeland Security chief Michael Chertoff, to advocate on their behalf.